Business case results include cash flow forecasts, financial metrics, and tactical advice for actions and investments. A compelling rationale turns business case results into decisive business case proof. Case-builders must be ready for the questions on everyone's mind: Is your proposal the best business decision? Will we really see these results? Business Case Financial results Begin with Cash Inflow and Outflow Forecasts. 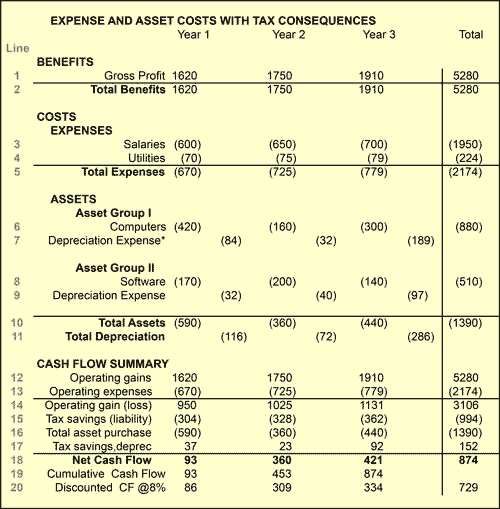 What is the Business Case Cash Flow Statement? Business case results begin with cash inflow and outflow forecasts, appearing in scenario CF statements. This article explains the role of cash flow statements in business case analysis, showing how case builders analyze cash flow to produce financial metrics, such as NPV, IRR, and ROI. For more instead on cash flow statements in financial accounting, see Statement of Changes in Financial Position. A dictionary definition for business case analysis might run as follows: "The business case is a decision support and planning tool that projects the financial results and other business consequences of potential actions or decisions." The word "projects" means the case looks forward in time, estimating future business results from one or more actions or decision options under consideration. A good business case anticipates financial business results as well as non-financial results ("other business consequences"). Sections below further explain and illustrate the first item the list above, in the context of business case forecasting, business case scenarios, and business case proof. For more instead, on non-financial costs and benefits in the business case, see the articles Business Benefits and its coverage of Key Performance Indicators. For in-depth coverage of business case cash flow statement content and structure, see the ebooks Business Case Guide or Business Case Essentials. What is a business case cash flow statement? Incremental cash flow statements: Showing what changes with an action? Finding cost savings and avoided costs. Incremental costs from benefit items. Cash flow analysis and proof: Scenario comparisons prove the case. 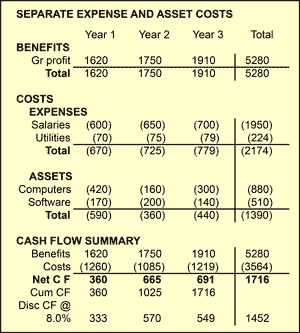 Business case vs. financial accounting CF statements. For more on cash flow management and cash flow analysis, see Cash Flow. For more on business case structure and content, see Business Case. Is there financial justification for the proposed asset purchase? If we implement the proposed initiative, what are the funding requirements from our capital budget? From our operating budget? Which investment proposals is the most promising? Which is least risky? Which course of action represents the better business decision? The analysis attempts to answer questions like these by predicting future business outcomes under one or more scenarios. The case includes one scenario for each possible action, decision, or investment under consideration. The analyst recommends action after analyzing and comparing the scenario cash-flow statement. 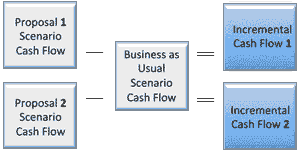 Exhibit 1 presents examples of the three business case cash flow statements for a case with two scenarios. This case analyzes two possible action scenarios. One scenario (Proposal Scenario, upper panel) represents a new product launch. The other scenario (middle panel) represents "Business as Usual" that is, continuing business without launching a new product. The analyst predicts cash inflows for two Benefit items in each scenario, "New product gross profit" and "Other product gross profit." There is a cash inflow estimate for each year of the period in view. These figures are inflows, not outflows, because they appear as positive numbers. The analyst also predicts cash outflows for three Cost items, which appear on the full-value statements as negative numbers (parentheses indicate negative numbers in). The upper two panels are full-value cash flow scenarios, to distinguish them from the bottom statement, the incremental cash flow statement (the following section further describes incremental statements. Full-value means simply that each cash inflow or outflow figure is its full value: a full-value outflow estimate of $510 means simply that $510 is the size estimate of the outflow. Note that both scenarios have the same benefit and cost line items, even though one scenario (Business as Usual) anticipates 0 cash inflow for all years of the analysis on one item (New product gross profits). Matching cost and benefit items for all scenarios in this way ensures that comparisons between scenarios are fair and objective. Matching scenario line items this way also makes it possible to create an incremental cash flow statement (next section). Which scenario should the analyst recommend? The analyst must analyze further before answering, but it is noteworthy from the upper two panels that three-year net cash flow is greater under the Proposal Scenario (7,170) than it is under Business as Usual (4,400). Note that full-value data of this kind are essential for budgeting and planning purposes. For decision support purposes, however, decision-makers turn to the incremental statement. To choose which scenario to implement (Business as Usual or Proposal), decision-makers could compare one full-value statement against the other. To make that kind of decision, however, the primary challenge is understanding how the two full-value statements differ. It is hard to identify and measure differences between scenarios, from only a side-by-side display of two full-value statements. To bring out the differences between scenarios, the analyst builds an incremental cash flow statement such as the one at the bottom of Exhibit 1 above, using the approach in Exhibit 2, below. The incremental statement shows only "what changes" after implementing the proposal scenario. This statement compares Proposal full-value figures with the corresponding figures on the Business as Usual full-value statement, simply and directly. For this reason, decision-makers will focus on the incremental statement when deciding which scenario to implement. The incremental statement in the example shows only the gain and loss increments that follow from implementing a product launch. It might appear at first that the incremental statement has the same set of line items as the full-value versions. However, upon Closer examination, it is easy to see that the line item names signal that they represent incremental data. The signal lies in the use of relative terms such as "increase," "decrease," and "savings." Notice also that the item "Service delivery cost..." now appears under "Incremental Benefits" instead of a cost category, and the item "Other product gross profit" is now under "Incremental Costs" but not "Benefits." The reason these items change categories isappears below. Exhibit 2. The analyst calculates Incremental cash flow for the Proposal Scenario by subtracting "Business as Usual" cash flow estimates from Proposal Scenario estimates." Where Δi , j is the incremental cash flow for line item i in year j. Cash inflows are positive values. Cash outflows have negative values. This convention for the full-value data helps ensure that sure that incremental values have the correct sign. A positive increment means that inflows increase, and a negative incremental value means that outflows increase. New product cash flow increases 1,500 in 2012. Subtracting a positive number or 0 from a larger positive number yields a positive number. Similarly, consider the 2012 incremental value for the cost item "IT support." The full-value IT support cost is a cash outflow under both scenarios, but the −800 Proposal Scenario outflow is larger than the Business as Usual outflow of −700. IT support costs (outflows) increase by 100 during 2012. Taking a smaller negative number away from a higher negative number yields a negative result. The most interesting incremental results occur when they reveal cost savings or avoided costs. Consider the line item "Service delivery costs" for the year 2012. Service delivery costs are non zero under both scenarios. Under the Proposal Scenario they are 420, but under Business as Usual they are larger (510). Here, the incremental result will be a positive number. A larger negative number subtracted from a smaller negative number yields a positive number result. This mathematical twist is the mechanism by which business case analysts identify and measure cost savings and avoided costs for the case (next section). Some people are unsure how to show in the business case that a proposal action leads to cost savings, or avoided costs. A cost savings seems like a "benefit," but it has to do with "costs." They ask: How do I find, measure, and present cost savings in my business case? Remember that savings is a relative term. One cannot find or measure savings without a baseline. In the business case, the Business as Usual scenario provides baseline data. All savings and avoided costs have meaning only relative to the baseline. In the example full-value cash flow statements above, for instance, "Service delivery costs" estimates have cash outflows of 420, 420, and 400, across three years, in the Proposal scenario. However, estimates for the same costs for the same years are 510, 520, and 540 under Business as Usual. Thus the proposal scenario shows a cost savings of 90, 100, and 140 for these years. The incremental cash flow statement captures these savings as positive cash flows, and labels them as "Service delivery cost savings" under "Incremental Benefits." On the full-value statements, "Service delivery costs" are "Costs" because they are cash outflows on both (full-value) statements. The "Service delivery" item moves the "Benefits" category on the incremental statement. It is also quite possible to discover avoided costs on the incremental statement. An avoided cost has the same mathematical properties as a cost savings, except that the term avoided cost refers to costs that have not yet occurred, but which certainly will occur under Business as Usual. Preventative health care and preventative maintenance are familiar examples of activities meant to create avoided costs: changing oil on the automobile at prescribed intervals, for instance, leads to an avoided cost for replacing an engine, which would certainly come under "Business as Usual" (that is, making no oil changes). Some finance professionals resist allowing avoided costs into a business case, probably because the future costs to avoid have not occurred yet, or possibly for other reasons. Nevertheless, if the analyst argues credibly that a cost is coming under "Business as Usual" and also show credibly that the cost is not coming with a proposed action, the avoided cost is a legitimate incremental cash inflow and benefit for the business case. You may notice one final result on the incremental cash flow statement involving another line item that changed categories, moving this time from "Benefit" to "Incremental Cost" categories. The item here is "Other product gross profit" which is less each year under the "Proposal Scenario" than under "Business as Usual." The cash flow statements show that this company will give up some profits for existing products ("Other products"), in exchange for a much larger incremental gain with "New product gross profit. However, the decrease in Other products gross profit" scores as an "Incremental Cost" on the incremental statement. The examples above present a business case with two action scenarios, where one is the baseline or "Business as Usual" and the other a "Proposal." Know to two full-value scenarios call for one incremental cash flow statement. Very often, however, several different possible actions are in view, and the business case has two, three, four or more "Proposal" scenarios. Exhibit 3 shows the general approach for building incremental statements in such cases. Exhibit 3. 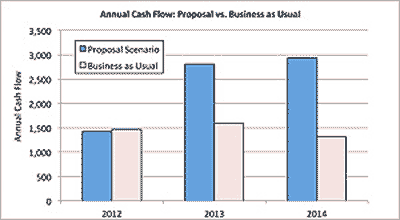 Incremental cash flows for two proposal scenarios, where both compared to the same Business as Usual scenario. When there is more than one proposal scenario, how many "Business as Usual" and how many incremental cash flow statements must the analyst producer?The good news is that the case builder needs only one "Business as Usual" scenario, no matter how many "Proposal" scenarios appear in the case. As Exhibit 3 suggests, each full-value proposal scenario relates to its own incremental cash flow statement. All incremental statements use the same Business as Usual statement as a baseline. One Proposal scenario and one Business as Usual scenario call for three cash flow statements: Two full-value statements and one incremental statement. Two Proposal scenarios and one Business as Usual scenario call for five statements (as in Exhibit 3): Three full-value statements and two incremental statements. Which scenario should the analyst recommend for action? Exhibit 4 shows the net cash flow forecasts for each scenario here. The full-value cash flow statements in Exhibit 1 provide the graphing data. That much is a point in favor of recommending the Proposal. Further analysis for the comparison, however, will focus on the incremental cash flow statement. The incremental cash flow data make possible the use of investment metrics, including Return on Investment (ROI), Payback Period, and Internal Rate of Return. The HIGH ROI result is a point in favor of undertaking the action. Whether or not this is a strong point in favor of undertaking the action depends on what the analyst finds for NPV from incremental cash flow statements for alternative uses of the same funds. Compared to Business as Usual, however, this is a high positive result. Using the incremental cash flow for the Proposal Scenario this action "pays for itself" in 1.03 years. Whether or not this is a strong point in favor of undertaking the action depends on the Payback Period from potential alternative uses of the same funds. See the article entry Payback Period for more on calculating and interpreting Payback Period. The very large ROI, IRR, and NPV, and the relatively short Payback Period all argue strongly for undertaking this action (launching the product). However, before committing to action, management will also want to see a thorough risk analysis for the proposal business case. Risk analysis will show the probabilities of actually achieving forecast results as well as the probabilities of seeing very different results. Is the Business Case CF Statement a Real CF Statement? Are these business case statements legitimate cash flow statements? the statement of changes in financial position? The business case cash flow statements appearing here are by all criteria rightly called "cash flow statements." They differ from financial accounting CF statements only in that these statements are forward-looking, whereas the statement for an accounting report looks backward in time. In either case, the statements show inflows and outflows separately, and then present their net result. For those who are familiar with the financial accounting cash flow statement, but less familiar with the business case statements, Exhibit 5, below, presents the major points of difference between the two kinds of statements. Proposal scenario cash flow statement. Statement of changes in financial position. reporting period, usually the end of each fiscal quarter and year. 2. Costs. 1. Sources of Cash. Cash outflows (or Costs, or Uses of Cash). A summary line totaling benefits (cash inflows) and another totaling costs (cash outflows). In the full-value statements, these lines are helpful for budgeting, planning, and revenue forecasting. A summary line for net cash flow, period by period, and in total. This line is the scenario's net cash flow, for the cost and benefit items analyses. A summary line for cumulative cash flow, period by period. This summary helps show when cumulative cash flow goes from negative to positive. The point in time when that occurs signals when "Payback" occurs. A summary line for present values (discounted cash flow values), whose total is the Net Present Value (NPV) of the net cash flow stream. Exhibit 7, below, is a slightly more complex cash flow statement. This version distinguishes between costs that are operating expenses and costs that are expenditures for capital items. Exhibit 7. Simple cash flow structure with separate sections for capital costs and operating expense costs. It is useful to structure the "Costs" section this way only when both kinds of spending are involved in the proposal action or investment. The distinction is useful in such cases because companies plan and manage capital spending (CAPEX) under a different budget then they use for operating expenses (OPEX). In other words, requests for the capital funding component of a proposal may have to go to different managers, with different priorities, and different spending criteria, then do requests for funding the operating expenses. The final cash flow statement structure appearing here represents the after-tax business case in Exhibit 8, below. Cash flow statements in this kind of case show the likely tax consequences of the forecast cash inflows and outflows. Exhibit 8. Simple cash flow structure with separate sections for capital costs and operating expense costs. in "Lease vs. Buy" business cases, decision-makers usually need to compare the tax consequences from buying with the tax impacts under leasing. For a decision-support case comparing business performance forecasts for operating in different countries will almost certainly need to include tax consequences from choosing one country over another if the countries have different taxing structures. When senior managers focus especially on the impacts of different action alternatives on the firm's income (earnings) after taxes. What Do You Need to Know to Start Building the CF Statement? When can the analyst begin building the business case cash flow statements? 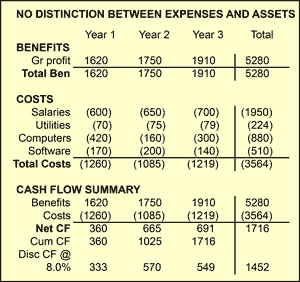 On the surface, the full-value cash flow statements appear to be little more than a simple table, with a list of benefit and cost line items on the left, and columns indicating periods (months, quarters, or years). Table cells will fill with cash inflow or outflow estimates for each line item in each period. A subject statement describing potential actions under consideration and the business objectives addressed by the actions. A purpose statement, describing who will use the case results, for what purpose, and specifically what information they need to meet that purpose. A list of the action scenarios under consideration for the case. Each cash flow statement must include all cost and benefit items included in all scenarios. Scope and boundary statements for the case. That is, the specification of the period the case covers, and all information necessary for determining whose costs and whose benefits are to include. A cost model, identifying cost items appropriate for the case. A list or inventory of benefit items appropriate for the case. For more on business case design and design elements, see the encyclopedia entry business case. Or, for complete coverage, see the book Business Case Essentials.